This article describes the technologies available to measure the thickness of cured and uncured coating powders. It reviews working principles and associated industry test methods and standards, and discusses recent trends in paperless quality assurance (QA). Measurement of film thickness should be a routine event for all powder coaters (Figure 1). Regular measurement helps control material cost, manage application efficiency, and maintain finish quality. Powder coatings manufacturers recommend target film thickness ranges to achieve the best performance characteristics and customers expect these parameters to be met. Powder film thickness can be measured both before and after curing with several different instruments. An example of one is shown in Figure 2. Every powder coating operation should know what equipment is available and how to use it. Film thickness is arguably the single most important measurement made during the application and inspection of protective coatings. Powder coatings are designed to perform their intended function when applied within a thickness range specified by the manufacturer. Many physical and appearance properties of the finished coating are directly affected by the dry film thickness (DFT). DFT can affect the color, gloss, surface profile, adhesion, flexibility, impact resistance, and hardness of the coating. The fit of pieces assembled after coating can also be affected when film thickness isn’t within tolerance. Precisely measuring finish thickness has other benefits, too. Whether to meet International Organization for Standardization (ISO), quality, or customer requirements for process control, companies need to verify coating quality to avoid wasting money reworking product. By checking their application equipment, they ensure the coating is being applied in compliance with the manufacturers’ recommendations. Applicators must apply the powder evenly (Figure 3) and according to the product specification sheet. Applying excessive DFT not only is wasteful, but also risks the possibility of incomplete cure and can drastically reduce overall performance of the coating system. High film builds often result in poor adhesion. The coating tends to peel or chip from the substrate. Regular testing can reduce the number of internal reworks and customer returns due to finishing defects. 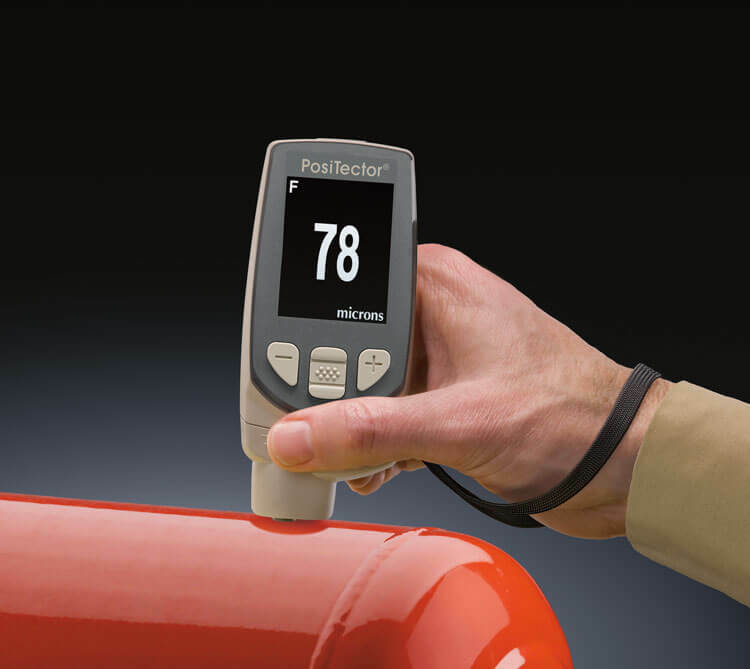 Measurements of powder coating thickness can be made by using different methods depending upon whether the test is being performed before or after powder cure. The American Society for Testing and Materials (ASTM) has a series of standards describing these techniques. Test Method D 4138 describes destructive measurements over rigid substrates made with cross-sectioning instruments. ‍Practice D 7091 describes nondestructive measurements over metal substrates made with magnetic and eddy current coating thickness gages. ‍Practice D 7378 describes three measurement methods for the thickness of applied, pre-cured coating powders to predict cured thickness. Film thickness measurements can be taken either before or after cure and crosslinking. The type of substrate, the thickness range of the coating, the size and shape of the part, and the economics of the job determine the method employed. On uncured applied powders, height measurement can be performed with powder combs and with electronic gages (Figure 4) employing special powder probes. Since coating powders generally diminish in thickness during the curing process, a reduction factor needs to be determined to predict cured DFT. Alternatively, ultrasonic instruments measure uncured powder without touching the surface and predict the cured thickness of the powder automatically. 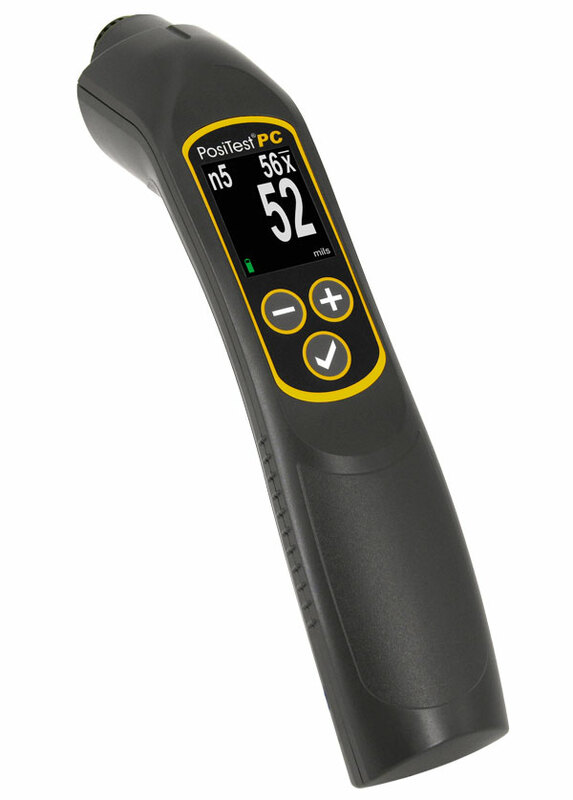 After cure, a variety of hand held tools are available to take direct DFT measurements on the coated part. These non-destructive instruments employ either magnetic, eddy current, or ultrasonic principles depending upon the substrate. Less common methods include micrometer measurement, destructive dry film methods such as cross-sectioning, and gravimetric (mass) measurement. The normal standard unit used in powder thickness measurement in America is the mil; 1.0 mil equals a thousandth of an inch (1/1000 inch). If the manufacturer’s specified thickness is 2.0 to 5.0 mils, the final cured thickness of the powder should be between 0.002 and 0.005 of an inch. The metric unit of measurement is called the micron (μm); 25.4 micronsequals 1.0 mil. Applicators must apply the powder evenly and according to the product specification sheet. This provides the maximum benefit from that particular powder specification. Most thickness testing specifications apply to the cured thickness of powder, so our look at different thickness measuring techniques begins there. Micrometers were one of the original tools used to check DFT and still have practical application today. They have the advantage of measuring any coating/substrate combination but the disadvantage of requiring access to the bare substrate. Two measurements must be taken: one with the coating in place and the other without. The difference between the two readings, the height variation, is the coating thickness. Two destructive techniques are also available. One is to cut the coated part in a cross section and measure the film thickness by viewing the cut microscopically. The other technique uses a scaled microscope to view a geometric incision through the cured coating. This method is used when inexpensive, nondestructive methods aren’t possible or when nondestructive results need to be confirmed. The most common way to measure cured powder thickness is with the use of electronic DFT gauges. They are hand-held, easy-to-operate, and relatively low-cost. They employ magnetic, eddy current, or ultrasonic principles depending upon the part material. Mechanical gages can be used when the part is made of steel. They employ a permanent magnet and a calibrated spring. The device measures the force required to pull that magnet from the coated steel surface. Magnetic pull-off gages are rugged, simple, inexpensive, portable, and usually don’t require any calibration adjustment. They are a good, low-cost alternative in situations that requireonly a few readings during production. For reasons of simplicity, versatility, accuracy, and record keeping, electronic DFT instruments are a popular choice for both large and small powder operations. They use a magnetic principle when measuring on steel and an eddy-current principle on the other metals, sometimes combined into one instrument. Measurement results are displayed on an easy-to-read liquid crystal display (LCD). A wide selection of probes is available to access unusual part shapes or to accurately measurevery thin or very thick coating systems. Non-metal applications such as coated plastic or wood require an ultrasonic pulse-echo technique (Figure 5). This presents opportunities to industries previously unable to perform non-destructive quality control at an affordable price. A benefit of this measurement technique is the possibility of measuring the individual layers in a multi-layer coating system. Measurement methods discussed so far have been for use on a part after the powder has cured. It’s also possible, and in some circumstances more desirable, to measure a coating immediately after application to predict the thickness of the cured powder. If a coating has been improperly applied, correction after it has dried or chemically cured requires costly extra labor time, may lead to contamination of the film, and may introduce problems of adhesion and integrity of the coating system. Measuring film thickness during application can determine the need for immediate correction and adjustment by the applicator. While most powder coating specifications give cured thickness targets, it’s possible to determine if applied powder is within thickness specifications before the finality of curing and crosslinking. There are good reasons for wanting an accurate prediction of cured DFT, especially on moving lines. Depending upon the length of the oven, the number of parts being cured, as well as the time required for the curing process and for manual DFT measurement after curing, there is a considerable delay before the operator can intervene in the application process to make any necessary changes. If coating defects are discovered, a considerable number of coated parts have to be reworked in a repair loop, or if reworking proves to be too expensive, they may even have to be scrapped. For some operations, these disadvantages are no longer acceptable for meeting the demands of modern finishing processes. Measuring powder in the pre-cured, pre-gelled state ensures correct cured film thickness. It enables the application system to be set up and fine-tuned prior to curing. In turn, this will reduce the amount of scrap and over-spray. Accurate predictions help avoid stripping and re-coating, which can cause problems with adhesion and coating integrity. ASTM D 7378 describes three procedures for measuring applied coating powders. Metal-notched gages. These tools manually determine thickness when hand-dragged through the applied powder. Similar to how a wet film gage works, the device determines powder height as being between the highest numbered tooth that made a mark and has powder clinging to it, and the next highest tooth that left no mark and has no powder clinging to it. These simple tools (Figure 6) are inexpensive but accurate only to within a few mils. Measurements can be made on a suitable rigid surface, but marks will be made in the powder that may not be covered when the powder flows in the cure process. Electronic gages. Devices that use a specially designed powder probe can measure applied powder thickness. Micro pins, which are integrated into the probe, penetrate the coating powder down to the substrate. The probe is then manually pressed down to the surface of the powder to effect a thickness measurement. This procedure is applicable to flat, metal substrates only and may leave marks in the final product. The above two procedures result in only a height measurement of the uncured coating powder. But as stated earlier, thickness specifications are most often stated in cured powder thickness. Since coating powders generally diminish in thickness by as much as 50 percent during the curing process, these two procedures require an established reduction factor to predict cured film thickness for each particular coating powder. This reduction factor is obtained by measuring the cured powder thickness at the same location where the uncured powder height measurement was taken and subtracting the before and after measurements. Non-contact ultrasonic gauges. Procedure C of ASTM D 7378 describes a relatively new type of instrument that has quickly become a popular solution for dry powder thickness measurement. It’s an ultrasonic device that can be used non-destructively on uncured powder to predict final DFT without leaving marks that affect the finish. These instruments are hand-held and battery-powered, and work right out of the box for most powders. Their simplicity of operation and ergonomic design allow them to be used quickly and efficiently by line operators. Non-contact coating thickness measurement instruments have the decisive advantage of being non-destructive. This means that, after measurement, the measured components can be re-introduced into the ongoing process. As simple as these instruments are to operate, a prudent user should verify their operation on a regular basis, especially when conforming to an internal ISO procedure. Three steps ensure best accuracy. Calibration of coating thickness gages is usually a documented process performed by the equipment manufacturer in a controlled environment. A Certificate of Calibration showing traceability to a National Metrology Institution can be issued. There is no standard time interval for re-calibration, nor is one absolutely required, but a calibration interval can be established based on experience and the work environment. A 1-year calibration interval is a typical frequency suggested by many instrument manufacturers. This is an accuracy check performed by the user with known reference standards. This quick check ensures that the instrument is measuring properly and that the user is operating it correctly. For many gages, accuracy can be verified by measuring plastic shims or epoxy-coated standards with assigned values traceable to a National Metrology Institution. Adjustment, or calibration adjustment, is the act of aligning the gage’s thickness readings to match that of a known reference sample to improve the accuracy of the gauge on a specific coating within a specific portion of its measurement range. 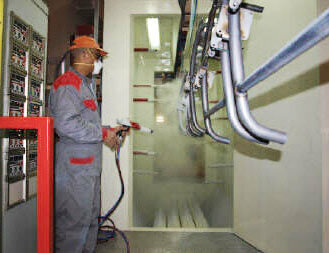 This operation is seldom required in the powder coating industry because acoustic properties don’t vary greatly among coating powder materials. In today’s competitive environment, customers often choose finishing companies that have solid quality control systems. By investing in a simple system that records and analyzes DFT results, powder coaters can study trends, reduce costs, and retain customers by providing them with documentation showing their ability to meet a required specification. A QA program can be as simple as developing a procedure that calls for a certain number of thickness measurements to be taken at the same location on each part. By recording all values, variations can be analyzed at regular intervals and corrective action taken if necessary. Manually gathering data with pen and paper is time consuming and error-prone, and can add significant cost to a coating project. 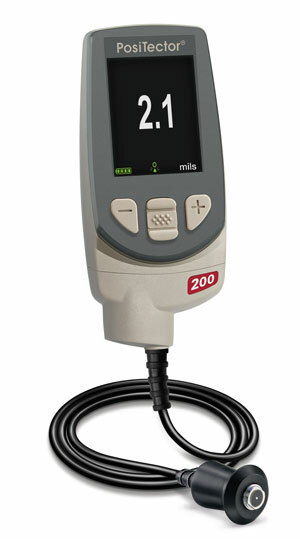 A thickness gage that stores measurement results simplifies this task. 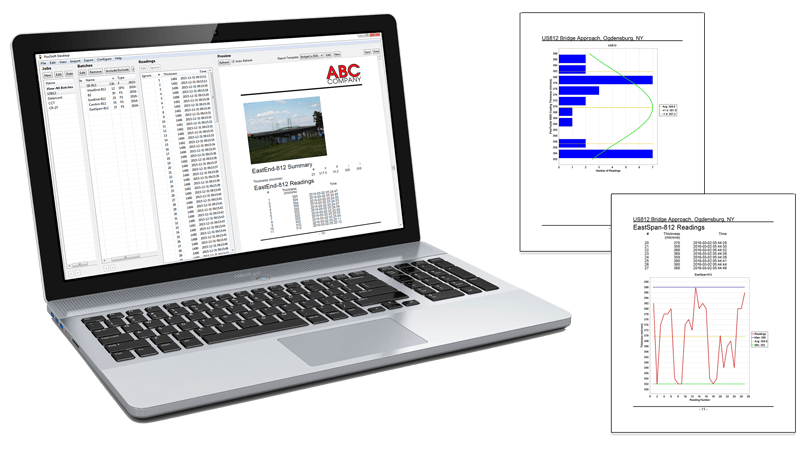 Automating the task of collecting readings is the best way to keep costs under control and to reduce human error. In digital format, data can be easily stored, reported, and exported. The collection of electronic data starts with electronic gauges that have on-board memory to gather measurement data digitally. (See Figure 7.) Some instruments can even produce rudimentary analysis during measurement by separating jobs or parts into batch memory and displaying real-time average thickness results and min/max limits. Alarms warn the user when a thickness result falls outside specification so that immediate corrective action can be taken. Next, the data must be transferred to a software program. While some instruments can wirelessly transmit each measurement as it is taken to a process controller or personal computer, it’s more common to store all results into gage memory and download them to a PC at the end of the work shift or when the job is complete. Downloading is accomplished with a Universal Serial Bus (USB) cable or with Bluetooth wireless communication. Powder coaters should be aware of an emerging trend towards a simpler, Web-based model. Gages are arriving on the market with built-in flash memory (mass storage) and the capability to wirelessly upload measurement data to the cloud for archiving and sharing with any Web-enabled device anywhere in the world. USB mass storage has effectively replaced a variety of interfaces such as serial and parallel ports. Gages are available that use a USB mass storage device class, which provides a simple interface to retrieve data in a manner similar to USB flash drives, cameras, or digital audio players. When the gage is connected via USB, any computer can view and download measurements stored in gage memory (in batches) by navigating a virtual drive. Stored readings and graphs can be viewed or copied using universal PC/Mac Web browsers or file explorers. See PosiSoft.net for further details. Remarkable developments have been made recently to gage technology and to Web-based applications. The collection of inspection data is becoming quicker and more cost efficient. Free Web-based applications can now synchronize with DFT gages via USB or Bluetooth Wireless Technology for an investment under $1,000. The timing is right for powder coating operations, large and small, to look seriously into updating their test instruments and quality systems. 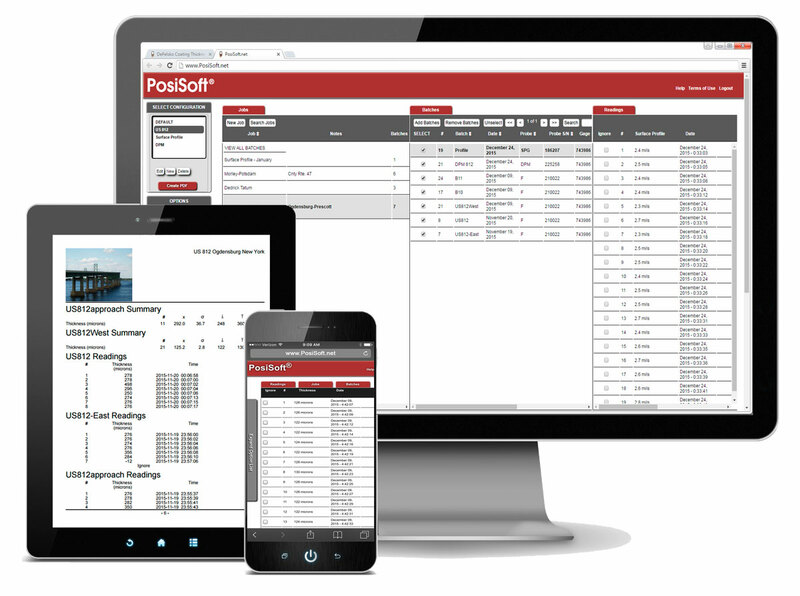 There are opportunities to take advantage of advances in both powder thickness measurement and in simple but powerful paperless quality control Web tools.